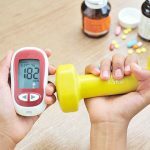 What should a diabetic diet consist of? This was the first question that came to mind when I was diagnosed with type 2 diabetes. There are several diets/lifestyles available to help manage diabetes. You may come across conflicting information about what the best lifestyle is to follow. I believe this conflict is occurring as medical professionals are continuously learning about diabetes. As a result, the advice given for diabetic control has changed. Traditionally, doctors recommend a low-fat diet for overweight diabetics. The intention is to lose weight and reduce the risk of conditions such as heart disease and obesity by reducing fat intake (particularly saturated fat). The foods consumed on this diet are low/reduced fat products, typically less than 3g of fat per 100g. The meals tend to consist of high amounts of carbs, low-fat dairy and lean cuts of meat. Following a low-fat diet will decrease the number of calories consumed. Carbs and protein have four calories per gram, whereas fat has nine calories per gram. As the food consumed is low in fat, and higher in carbs and lean protein, it means you can eat more for fewer calories. This diet has been shown to help some people lose weight and reduce cholesterol levels. A high intake of carbs will increase blood glucose levels and insulin resistance. This increase is not ideal when trying to manage blood glucose or circulating insulin levels. Low-fat diets have also been shown to increase triglycerides and lower the “good” cholesterol, HDL. However, there is no proof that low-fat diets reduce the risk of cardiovascular disease and cancer. A reduced/low carb diet typically consists of less than 130g of carbs per day. Individuals may increase their fat intake to provide fuel for their body in place of the carbs. A ketogenic diet is a very low-carb diet consisting of around 20-50g per day. The low carb diet is paired with a high fat intake to promote the production of ketones which burn fat for energy in place of glucose. A low carb diet has many benefits. These include a reduction in blood glucose levels, circulating insulin levels, insulin resistance, triglycerides, blood pressure, fatty liver and increases HDL. I have reduced my blood glucose levels by following a low carb diet. As a result, I am off diabetic medication and now have “non-diabetic” blood glucose levels. My blood pressure also reduced, so my GP took me off my blood pressure medication. Unfortunately, after a few weeks, it began to rise. So I am now on a smaller dose of blood pressure medication. My triglycerides have also reduced to below 1.2mmol/L. 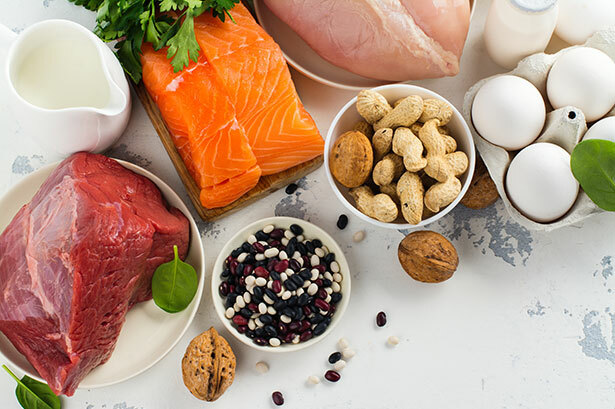 A disadvantage of the low carb diet is that the individual needs to have education on what to eat and how to follow the diet correctly to avoid side-effects. People on insulin or insulin-producing medication can be prone to hypos on a low carb diet. Individuals may notice a drop in blood pressure, and in some cases, their blood pressure may drop too low. These disadvantages need not be a problem with the correct support from a medical professional. It is important to let your doctor/dietician know if you decide to adopt a low carb lifestyle. Take a look at our low carb recipes, we are forever adding new guilt-free dishes. The definition of a Mediterranean diet varies from country to country. Typically, the Mediterranean diet is made up of large amounts of vegetables, fruits, legumes, nuts, beans, cereals, grains, fish and unsaturated fats such as olive oil. A low to medium intake of meat and dairy food is standard in most countries. Benefits linked to a Mediterranean diet include the reduction of risk of heart disease, some cancers, diabetes, Alzheimer’s and Parkinson’s disease. As the Mediterranean diet varies, some countries may consume a high amount of carbs or red wine. Excessive consumption of these can have a negative impact on health, such as raising blood glucose levels. Intermittent fasting covers various diets/methods that rotate between a fasting and non-fasting period. It often includes calorie restriction to promote weight loss. The most commonly known diet is the 5:2 diet. The amount of fasting time varies between plans. There is the 16:8 method, where the individual fasts for 16 hours and eats during an 8 hour period. The 5:2 diet, where fasting occurs twice a week and just 500 calories are allowed on these days. Some individuals fast for 24 hours twice a week. Others do alternate fasting where they fast every other day. Another method, known as the Warrior diet, is to fast during the day and eat a large meal at night. Alternatively, individuals may just skip meals when convenient. For more information on intermittent fasting, check out dietdoctor.com. The main advantage of intermittent fasting is that it is supposed to reduce the hormone “IGF-1” which causes the body to make new cells instead of repairing old ones. A reduction in this hormone can encourage the body to mend old cells. This reduction is thought to reduce the risk of long-term complications associated with aging. Intermittent fasting is also known to reduce insulin levels and insulin resistance. The main disadvantage of intermittent fasting is the tedious chore of calorie counting (if you are following a calorie restricted diet) which some individuals find frustrating. Fasting is not suitable for everyone, as some people feel too weak or poorly. If you are on insulin or insulin-producing medication, fasting can increase the risk of hypos. You should contact your doctor before you try fasting as this might not be suitable for you. If you would like to know more about intermittent fasting, I highly recommend reading The Complete Guide to Fasting: Heal Your Body Through Intermittent, Alternate-Day, and Extended . It is a fanastically detailed book written by Dr Jason Fung, who specialies in fasting and helps patients achieve diabetic remission, and Jimmmy Moore who is a popular blogger following a low carb and fasting lifestyle. Carbs are broken down into glucose when eaten. As we are trying to manage the amount of glucose in our blood, we should limit the number of carbs we consume. The more carbs we eat, the higher our blood glucose level will be. Traditionally, medical professionals would recommend a “sugar-free” diet for blood glucose control. This diet included a limited amount of sugary carbs but encouraged eating starchy carbs as this was believed to have a slow effect on raising blood glucose. However, research has shown that this isn’t technically correct. Starchy foods are made up of a large number of glucose units. Depending on the type of starchy carb, the rate at which glucose enters the blood differs. High glycaemic index (GI) foods quickly release glucose whereas low GI foods slowly release glucose. Although low GI carbs are better for blood glucose control, the total amount of carbs is what impacts the blood glucose levels. Once you have discovered the right amount of carbs for you, you can look at swapping out high GI carbs for low GI carbs. All food and drink can contain carbs and contribute towards the daily carb limit. For non-diabetics, the recommended carb intake is 260g a day. An individual with diabetes cannot tolerate this amount of carbs and should limit their carb intake. Approximately 130g of carbs is required daily for the brain to function adequately. However, the body can source energy from protein and fat if needed. For individuals following the ketogenic diet, the brain receives the majority of its fuel from ketones. Ketones burn fat for energy in replacement of carbs. What fruit is suitable for a diabetic diet? Fruits are full of vitamins and minerals but can be high in carbs. You can still include fruit as part of a healthy balanced diet, however, you need to be mindful of the amount you eat. It is helpful to know what fruit is high or low in carbs. Apricots. A 100g serving consists of 7g of carbs. Blackberries. A 100g serving consists of 7g of carbs. Blueberries. A 100g serving consists of 9g carbs. Clementine. A 100g serving consists of 7g of carbs. Kiwi. A 100g serving consists of 9g of carbs. Raspberries. A 100g serving consists of 5g of carbs. Strawberries. A 100g serving consists of 6g of carbs. Banana. A 100g serving consists of 13g of carbs. Cherries. A 100g serving consists of 12g of carbs. Grapes. A 100g serving consists of 15g of carbs. Mango. A 100g serving consists of 14g of carbs. Persimmon. A 100g serving consists of 20g of carbs. Pomegranate seeds. A 100g serving consists of 16g of carbs. What dairy is suitable for a diabetic diet? Dairy products contain a natural sugar called lactose which converts to glucose when consumed. There are many low carb dairy products available. However, there are some that are high in carbs. Cheese. Typically, cheese is low in carbs. Many servings have 0-3g of carbs per 50g. For example, cheddar has 0g of carbs per 50g. Cottage cheese has 2g of carbs per 50g. Feta has 1g of carbs per 50g and mozzarella has 0g of carbs per 50g. Single and double cream. 1 tbsp consists of 0g of carbs. Butter and margarine. Both contain 0g of carbs per 1 tbsp. Milk. Whole, semi-skimmed and skimmed milk has 7g of carbs per 150ml. Many people, including myself, have swapped cows milk for almond milk. As unsweetened almond milk practically has 0g of carbs per 150ml. Yogurt. Most types of yogurt have added sugar in it. Fruit yogurt contains 17g of carbs per 125g. Soy yogurt contains 16g of carbs per 125g. Natural yogurt contains 10g of carbs per 125g. A better choice would be a Greek yogurt at 6g of carbs per 125g. What vegetables are suitable for a diabetic diet? Vegetables also contain carbs. Root vegetables, such as potatoes, are typically high in carbs. Asparagus. A 80g serving consists of 1g of carbs. Aubergine. A 80g serving consists of 3g of carbs. Avocado. A whole avocado ( 140g ) consists of 3g of carbs. Bean sprouts. A 80g serving consists of 3g of carbs. Broccoli. A 80g serving consists of 2g of carbs. Cabbage. A 80g serving consists of 2g of carbs. Cauliflower. A 80g serving consists of 3g of carbs. Celery. A 80g serving consists of 1g of carbs. Cherry tomatoes. A 80g serving consists of 3g of carbs. Courgette. A 80g serving consists of 2g of carbs. Cucumber. A 80g serving consists of 1g of carbs. Edamame beans. A 55g serving consists of 1g of carbs. Green beans. A 80g serving consists of 3g of carbs. Leek. A 80g serving consists of 2g of carbs. Lettuce. A 80g serving consists of 1g of carbs. Mushrooms. A 80g serving consists of 0g of carbs. Peppers. A 80g serving consists of 2g of carbs. Radishes. A 80g serving consists of 2g of carbs. Rocket. A 80g serving consists of 0g of carbs. Spinach and spring greens. A 80g serving consists of 1g of carbs. Tomato. A 80g serving consists of 2g of carbs. Turnip. A 80g serving consists of 2g of carbs. Butter beans. A 80g serving consists of 10g of carbs. Butternut squash. A 130g serving consists of 10g of carbs. Carrots. A 80g serving consists of 5g of carbs. Celeriac. A 80g serving consists of 7g of carbs. Onions. A 80g serving consists of 6g of carbs. Peas. A 80g serving consists of 8g of carbs. Parsnips. A 80g serving consists of 15g of carbs. Plantain. A 80g serving consists of 23g of carbs. Potatoes. A 80g serving consists of 14g of carbs. Sweetcorn. A 80g serving consists of 11g of carbs. Being diabetic doesn’t mean that you cannot eat food higher in carbs, it just means you need to be aware of your carb intake. You may choose to eat low carb options so you can have more. A diabetic diet does not have to be boring or bland. I remember feeling quite fearful of food and out of options. This is not the case! Luckily, there are plenty of amazing websites and recipe books full of low carb food suitable for a diabetic diet. Take a look at our ever-growing library of diabetic recipes and enjoy the delicious guilt-free meals and desserts! If you are unsure about the number of carbs you should be eating, I suggest speaking to your doctor or diabetic nurse. Another option is to test your blood glucose levels after eating your meals, this is how I discovered, through trial and error, the number of carbs I can eat without spiking my blood glucose levels. For example, let’s say you ate a meal that consisted of 30g of carbs. If your blood glucose levels spiked within 2 hours after eating, you could reduce the number of carbs in your next meal until you find the right amount for you.